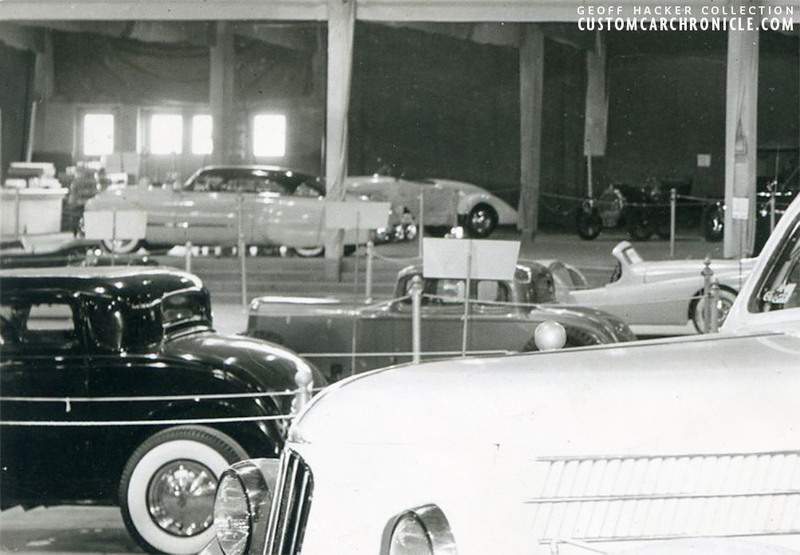 In 1951 and 1952 the Indiana State Fair was hosting the Custom Auto Show. A unique show with the best Hot Rods and Custom Cars the mid-west of the US had to offer. Part One. 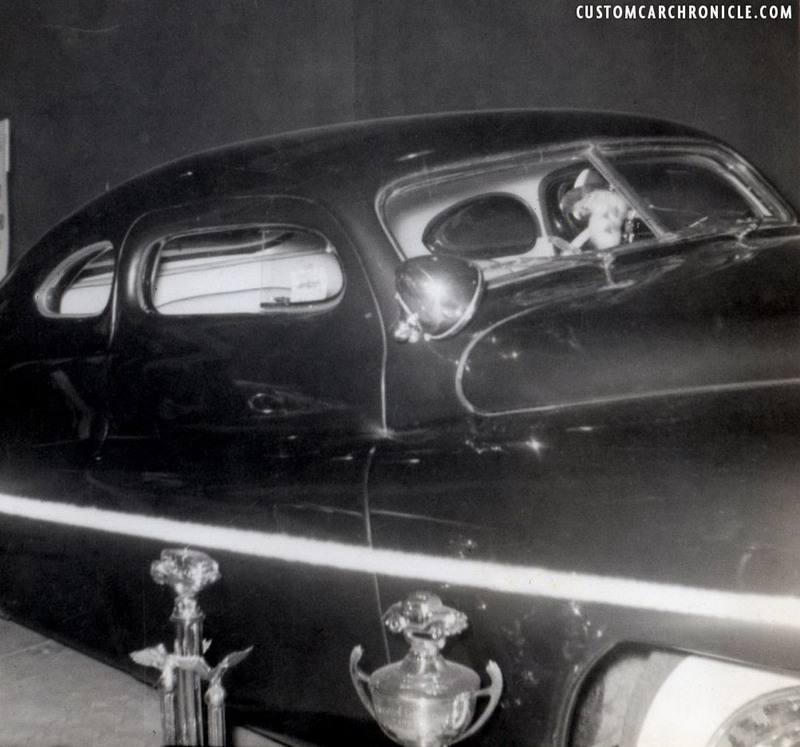 The first Hot Rod and Custom Car Shows were organized in Southern California back around 1948. 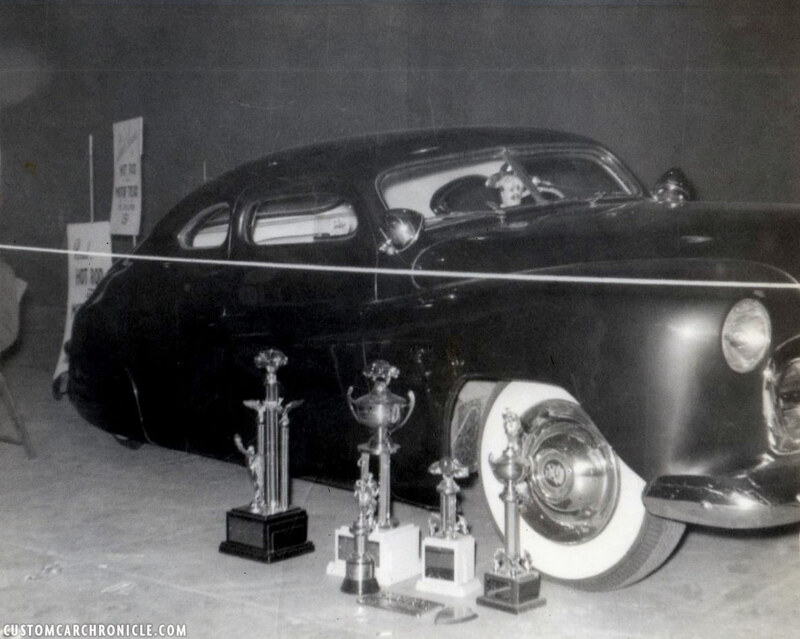 The Hot Rod and Custom Car scene had developed there over the years, and these first Car Shows specialized in Hot Rods and Custom Cars were a huge success. The word of the big success spread fast, just as the rest of the Hot Rod and Custom Car scene and by 1950 these Hot Rod and Custom Car shows started to pop up in different states as well. late 1950’s. The show sported Hot Rods, Custom Cars, Sports Customs, and Classic Cars of all sorts. Cars from many states, even as far as California, would make the trip to enter the competition­. 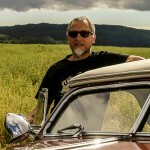 Geoff Hacker has shared his amazing “The David Disney Collection.” with the Custom Car Chronicle. 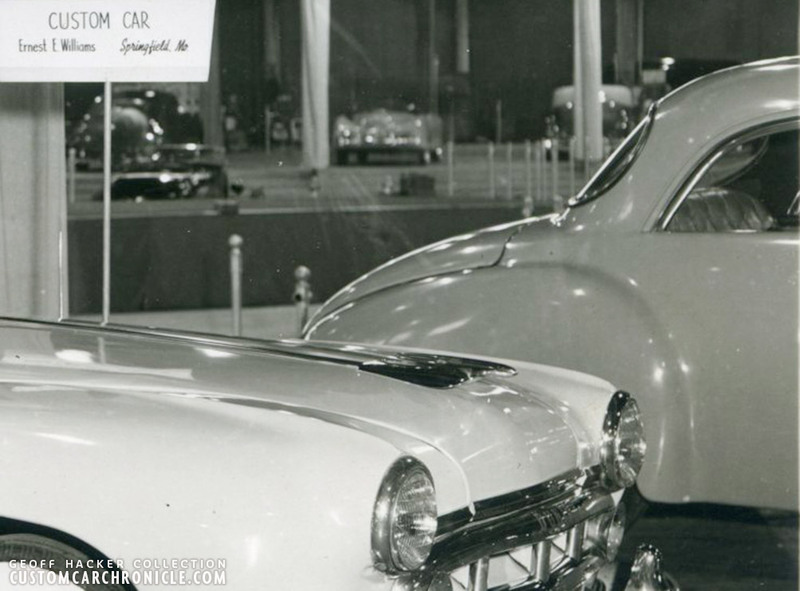 Included in this collection are a series of photos taken at the early Indianapolis Auto Shows from 1951, 1952 and a few from later shows. Many thanks to Geoff Hacker for sharing his collection. Indiana State Fairgrounds, where the Custom Auto Show was held and the 1951 and 1952 show programs. 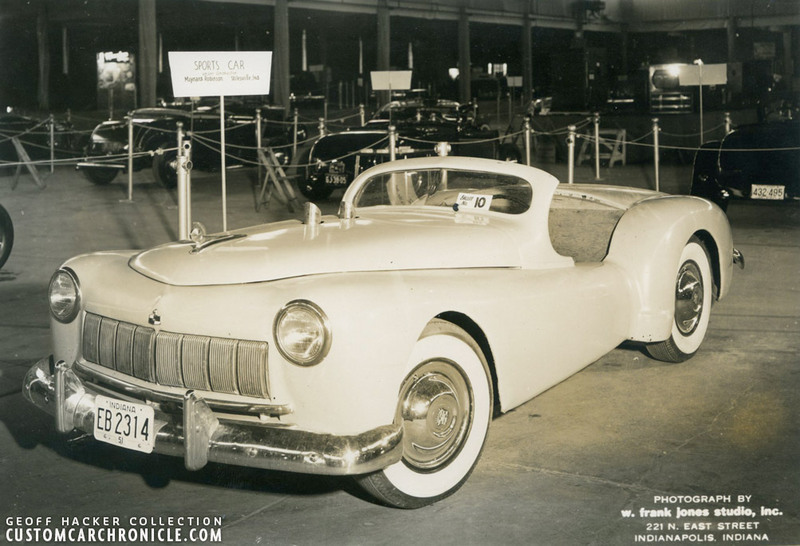 Clyde Bangiola from New Jersey displayed his 1947 Ford padded topped convertible at the 1951 show. 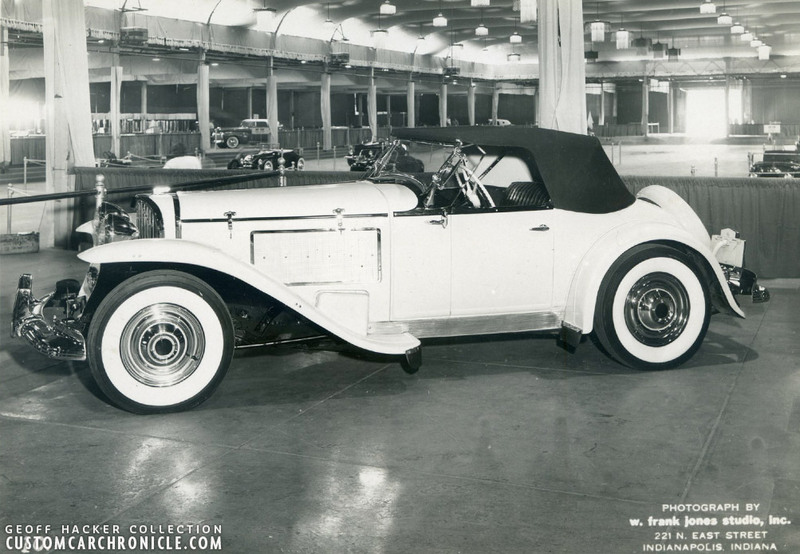 He had bought this original Barris Custom Convertible in damaged condition and had repaired all the body damage and painted the car in midnight blue. 1941 Ford convertible owned by Hank Langsenkamp III has the typical California look that had made it to the Mid West with the help of magazines, and guys traveling to California and bringing back stories, and photos. 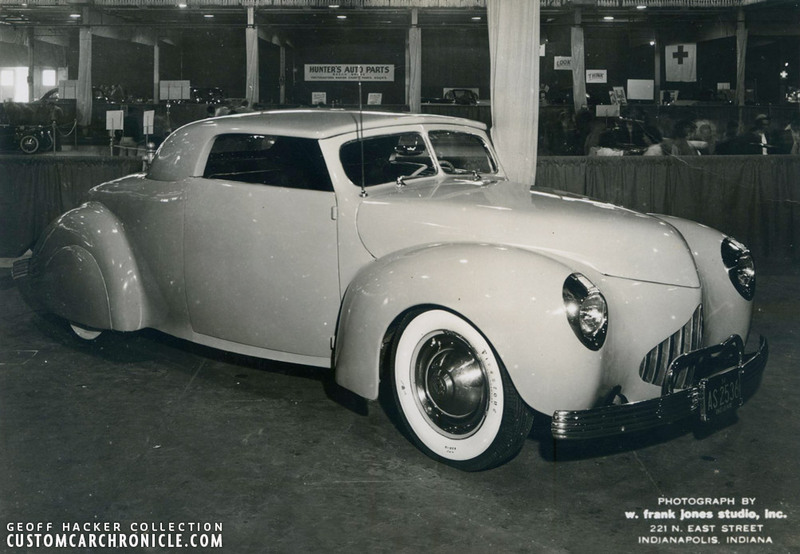 The windshield was chopped with matching padded top, molded fenders, frenched headlights and an aftermarket filled-in center grille. A closer look at the front of Hank Langsenkamp III great looking 1941 Ford. 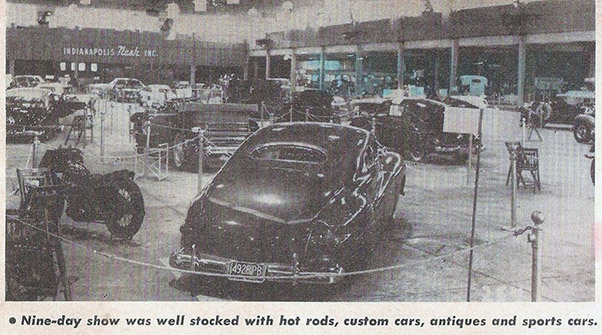 A bit of an overview photo showing some of the Hot Rods in the foreground and Jim Skonzakes’s 1949 Buick sitting in the background. 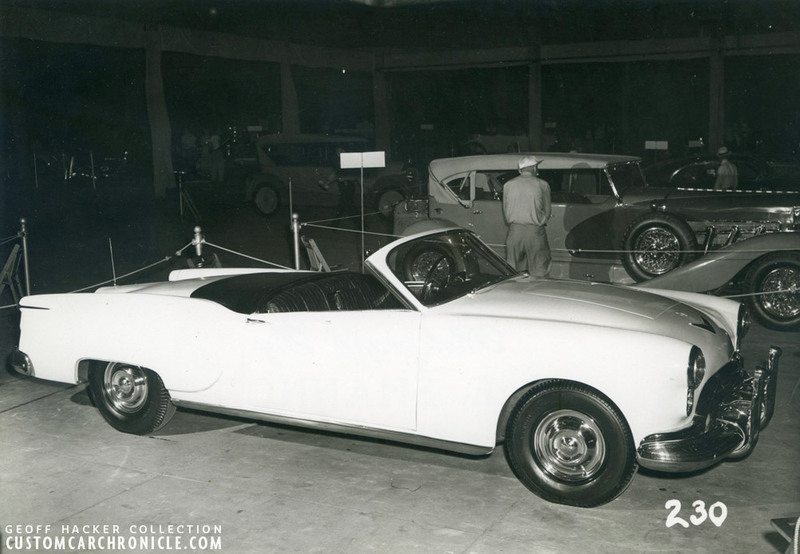 Jim Skonzakes brought two of his custom cars to the 1951 event, both had been created in Los Angeles. 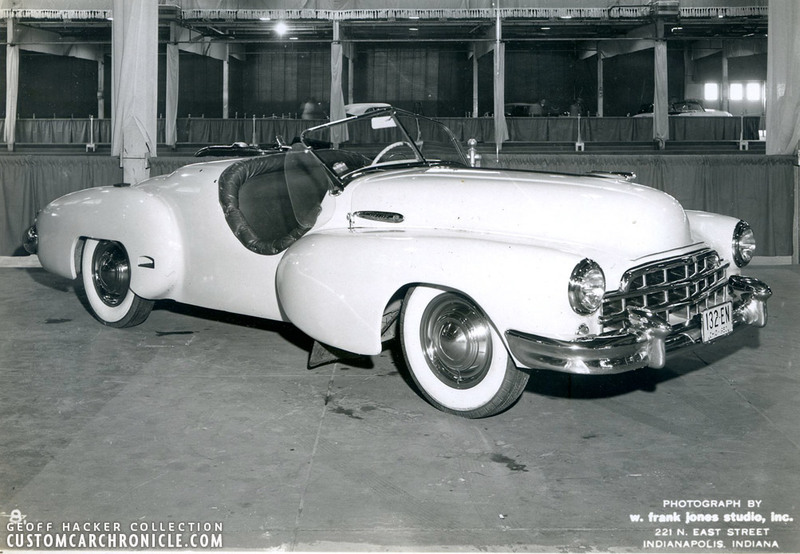 Here is his 1949 Buick convertible that was created mostly at the Barris Kustom Shop. 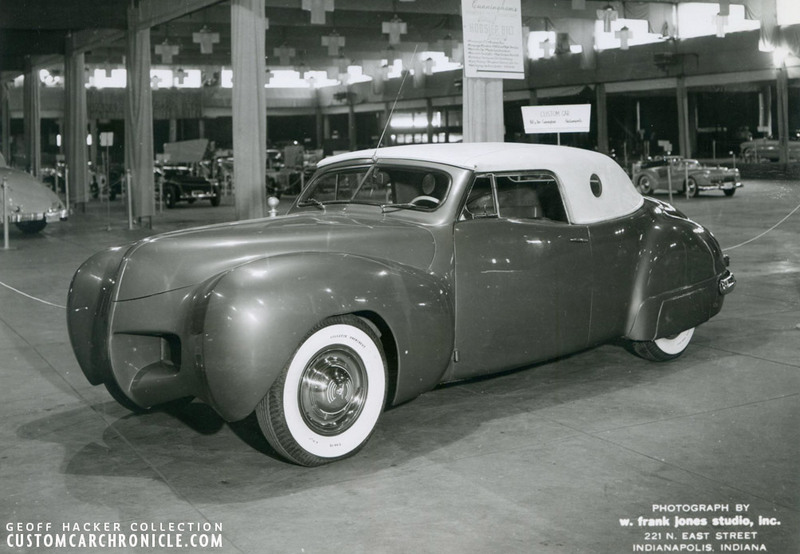 It started out as a convertible to which Jim added a heavily modified Cadillac top. Jim Skonzakes also brought the Jack Stewart Ford which he had just bought in Los Angeles. 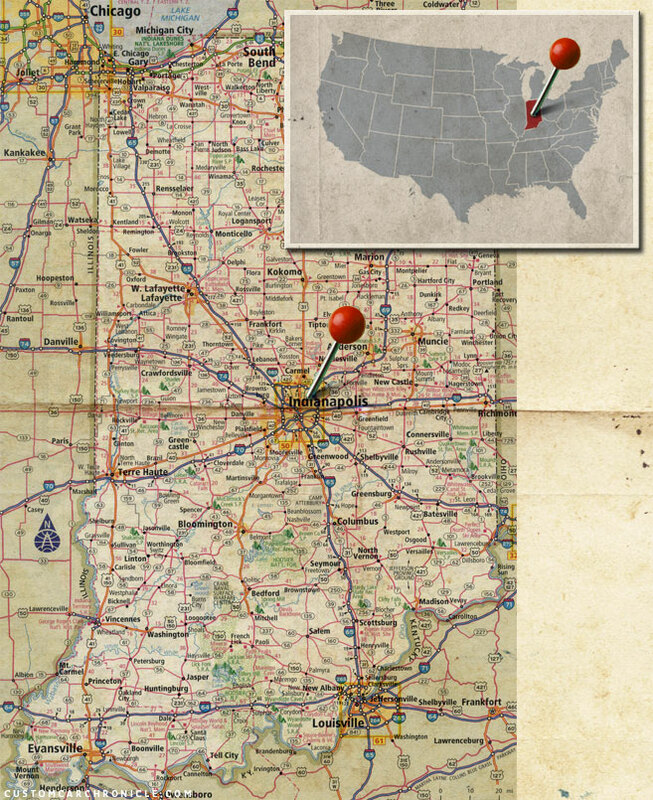 Jim drove the car from California to his home in Dayton, Ohio. 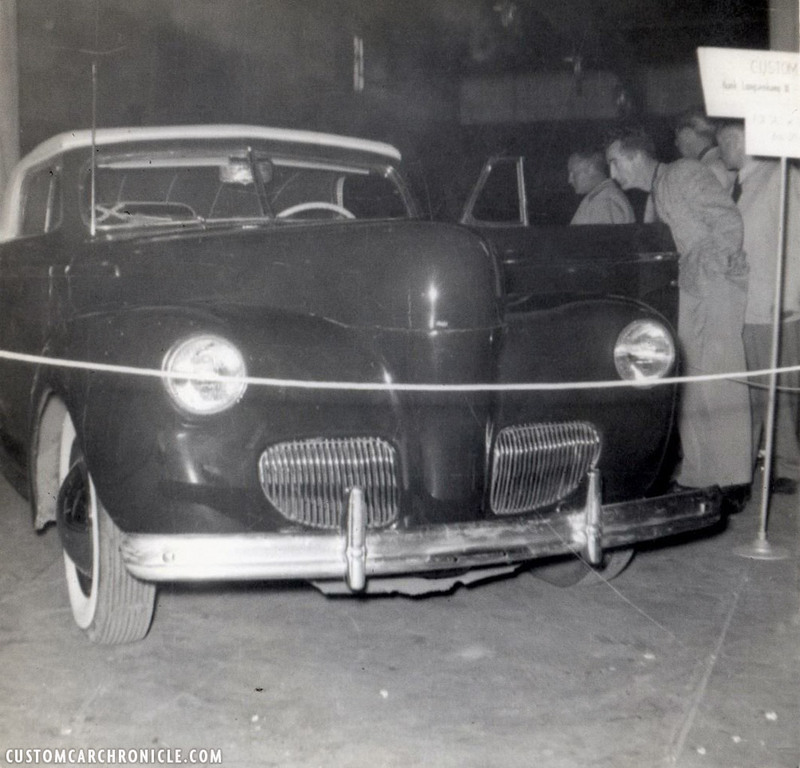 This photo was taken at the 1951 show and the car still had California license plates mounted. Later at the show, they moved the car more towards the wall. 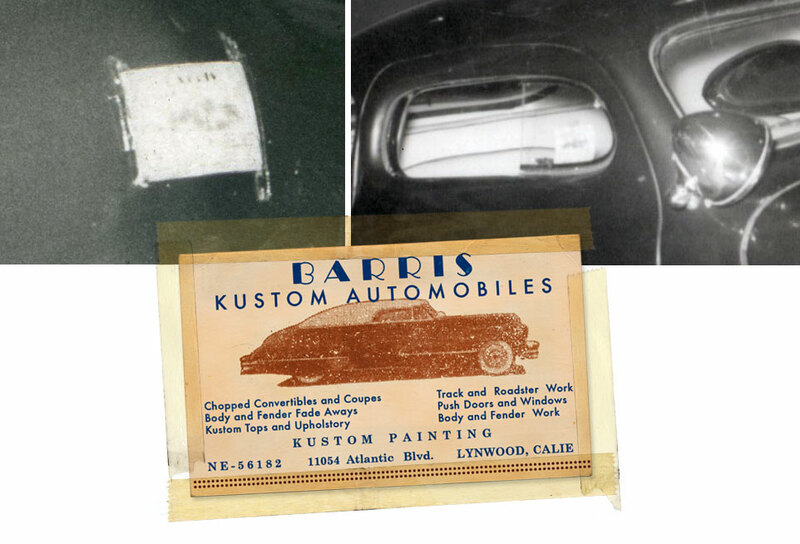 A little closer reveals that Jim had placed a Barris Business Cars in the passenger vent window. 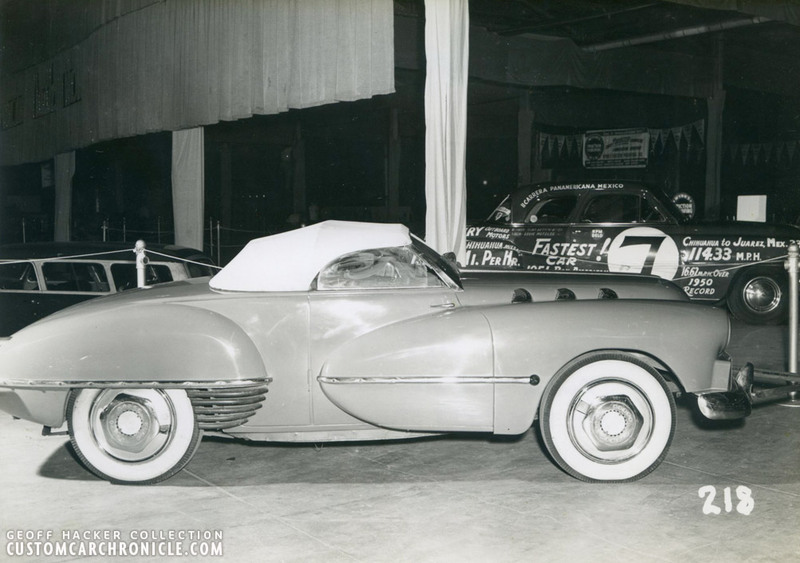 Jim Skonzakes brought the Jack Stewart ’41 Ford to the Indianapolis show again in 1952. No it had 1951 Ohio plates, and taped onto the hood is a Barris business card to promote the body shop in the Mid-West, and to show that the car was created in California. Something very important for Jim, who was very much in love with California. A bit more overview in this snapshot shows that Jim Skonzakes also showed his drag bike “The Beast” at the ’52 Show. In the background we can also see the Barris Larry Ernst 1951 Chevy. Jim snapped this picture of the Jack Stewart Ford going home from the Indianapolis Show in 1952. The Barris Business Card is still taped to the hood. Its a bit hard to tell from the photos, but Jim Skonzakes once confirmed it was the Barris card with the Cadillac on it. that was taped to the front of the hood. Hot Rod magazine show feature photo. 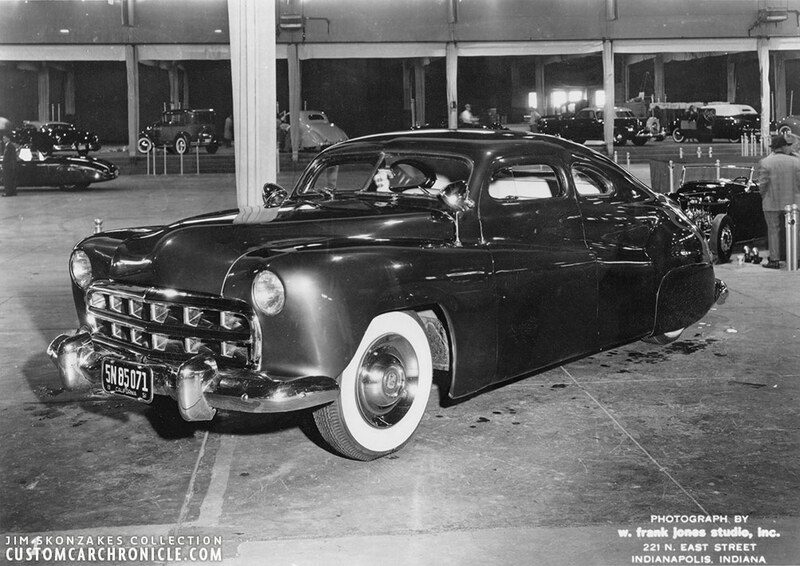 Taken at the 1951 Custom Car show, the Rudy Makela 1942 Cadillac designed and built by Indianapolis Power Hammer Works, Indianapolis, Indiana. The Rudy Makela, also name “WOW” Cadillac was at the show again in 1952, now updated with a new front. Possible engine cooling problems had the owner redesign the front of the car with a new large hood scoop/grille. Also the front now has the wheel opening cut out, possibly to fix a wheel turning problem caused by the fully skirted first version. 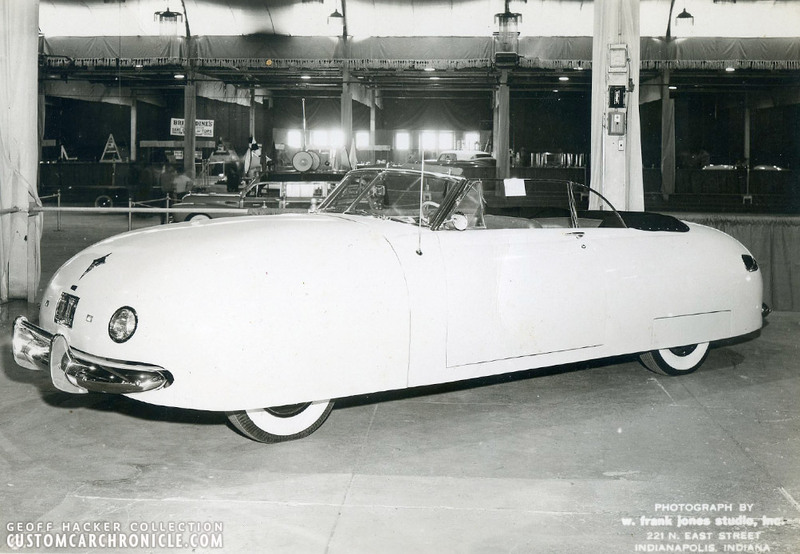 More on the Makela “WOW” Cadillac HERE. Also show at the event in ’51 or ’52 is this in progress project that has a lot of similarities with the “WOW” Cadillac above. Possibly this project was also done at the Indianapolis Power Hammer Works. 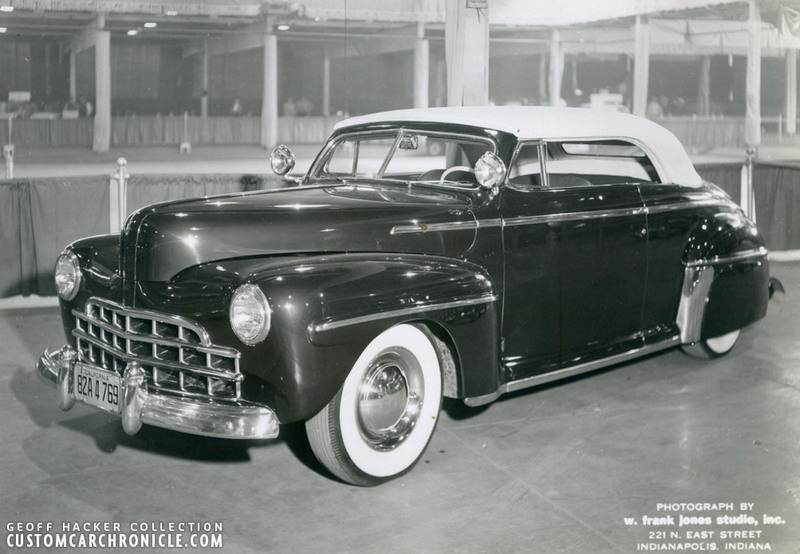 All hand-made body, with the use of a Buick grille and ’49-50 Mercury bumpers and a large V-Windshield. I do not recall ever seeing finished photos of this. 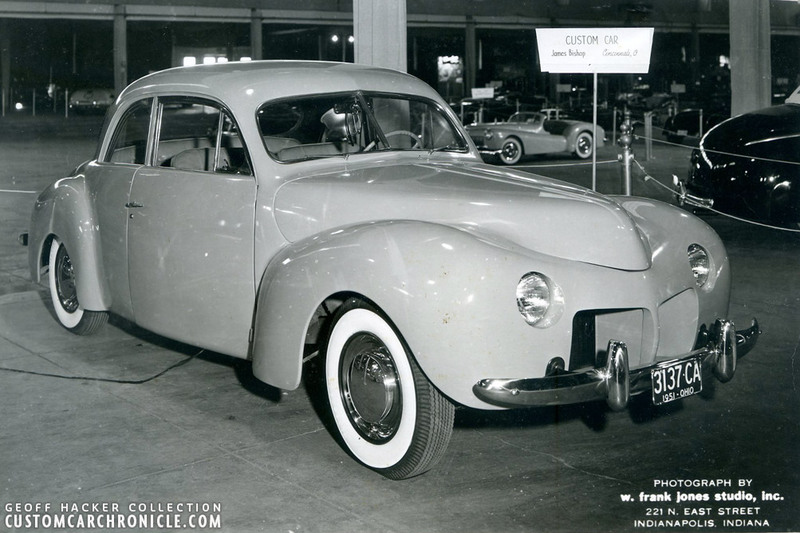 James Bishop brought his heavily restyled yet un-chopped 1940 Mercury coupe to the show. The car is channeled with the running boards removed, molded fenders, filled belt-line, sectioned hood, early 50’s Lincoln headlights, custom grille and a new wide rear window installed (possibly a ’50 Mercury unit). 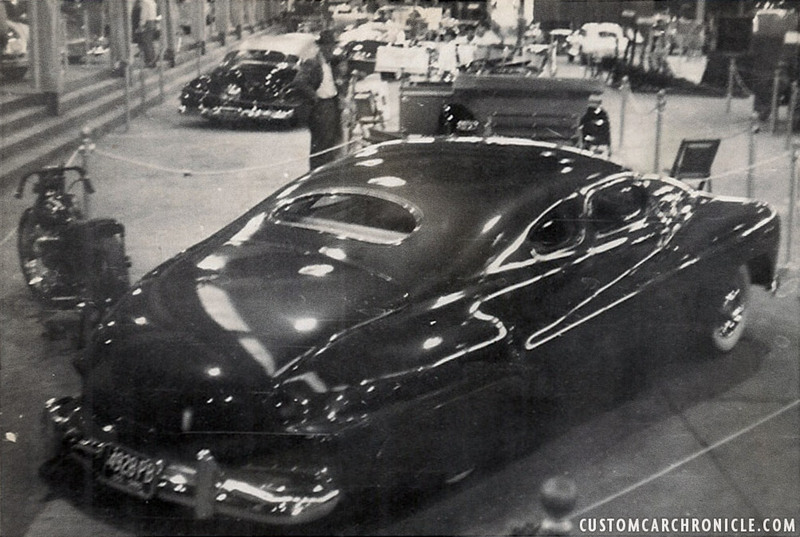 In another photo of the show we can see the unique large rear window in James Bischop ’40 Mercury a bit better. Interesting mix of Custom and Hot Rod with DeSoto bumpers, aftermarket hubcaps looks to be Lincoln based. 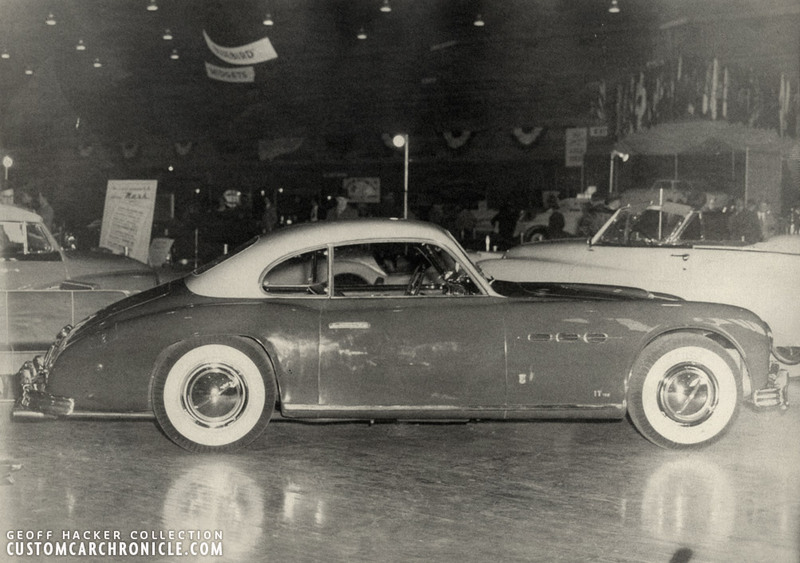 Richard Rush of Washington had Bud Unger restyle this very rare 1950 Italmeccanica IT160 Coupe prototype. 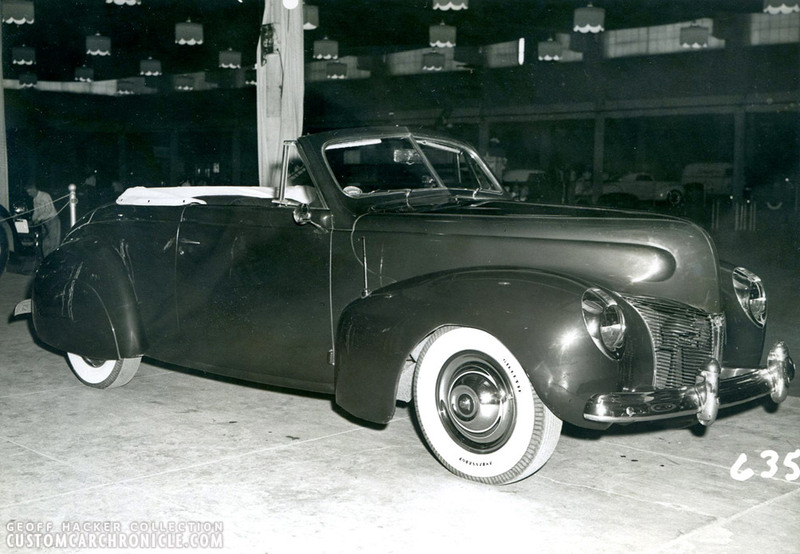 The car was left mostly as it was, but Bud added ’49 Plymouth bumpers, single bar hubcaps on wide white wall tires. Bud also painted the car Chariot Red and light tan. 1950 Oldsmobile “88” Convertible Sports Custom restyled by Wally Troy of Wally’s Garage in Springfield, Illinois. 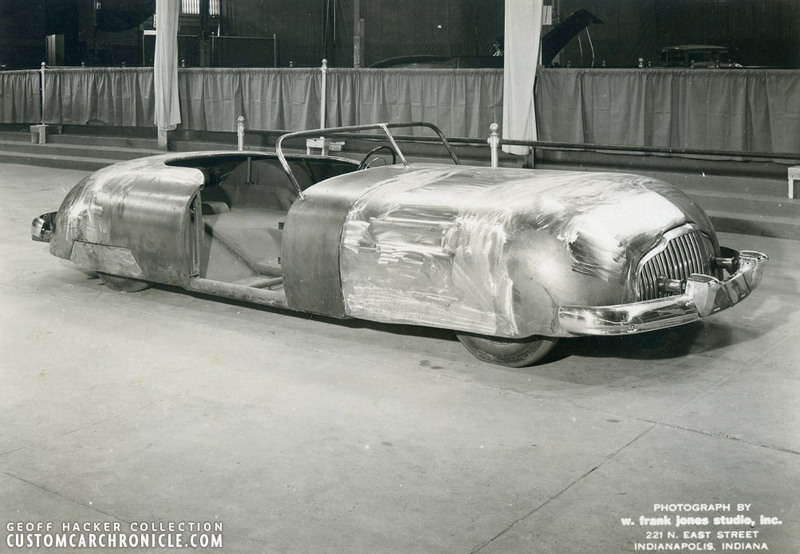 The project was based around a wrecked 1950 Oldsmobile Convertible. The front and rear were dramatically modified with pie-cut sectioned and further reshaped hood and trunk. hood and rear deck on the Olds were sectioned to lower the car and hand finished from sheet stock. 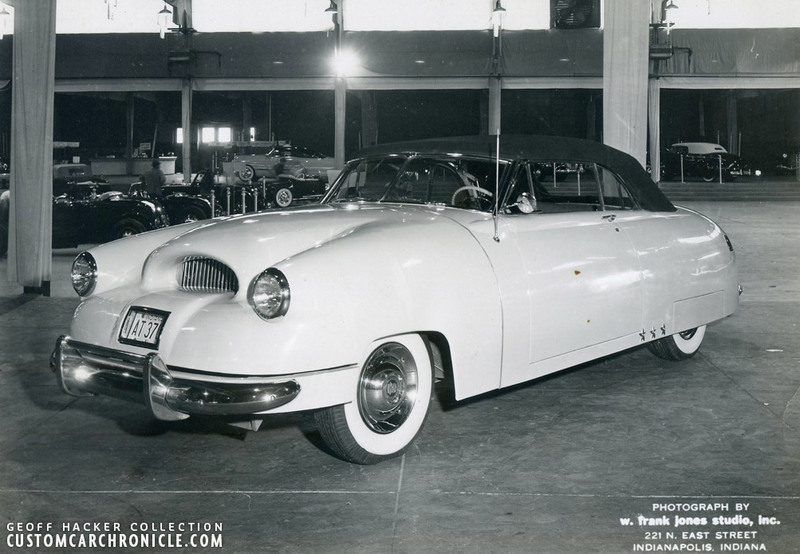 1951 Packard windshield was added on a much steeper angle and the top of the doors were pie-cut and reshaped for more swooping lines and blended in to ’50 Oldsmobile 98 rear fenders. 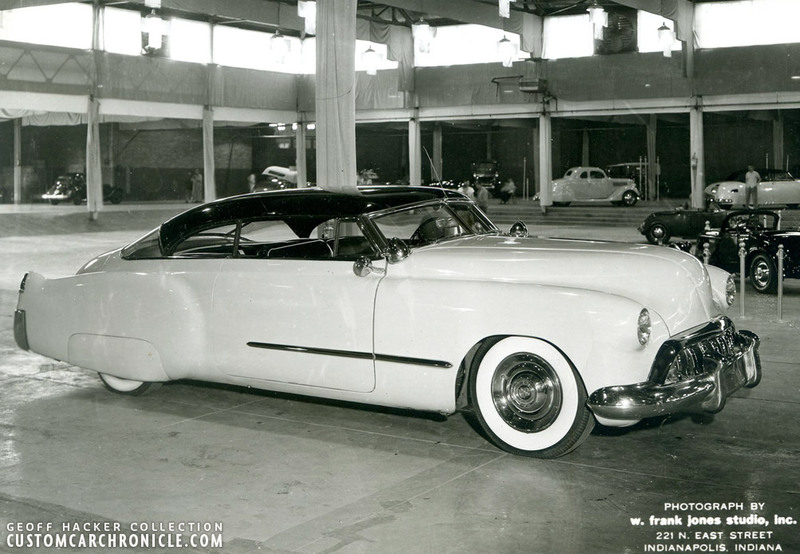 The center of the trunk was reshaped styled after the very popular at the time 1951 Buick XP-300 concept car. W.B. Dorr brought his really wild Custom Convertible all the way from Texas. 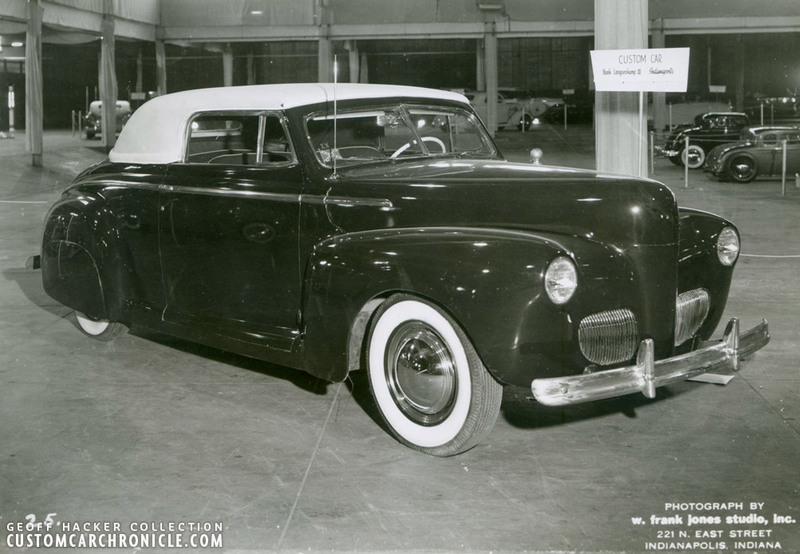 It looks like his car was based on a ’39 Ford convertible that looks to be channeled with the running boards removed. 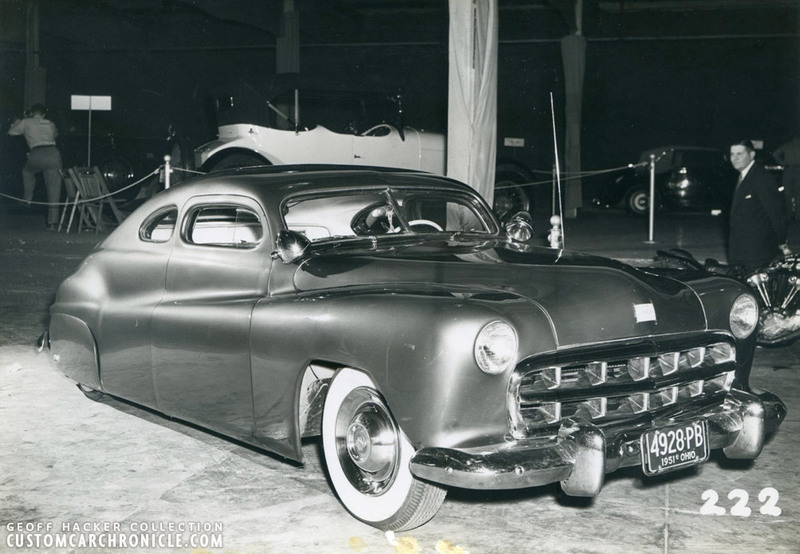 He then added a whole list of newer car parts, including heavily modified ’41 Ford front fenders, Possibly late 40’s Buick rear fenders, Buick like grille to create his ultimate custom. 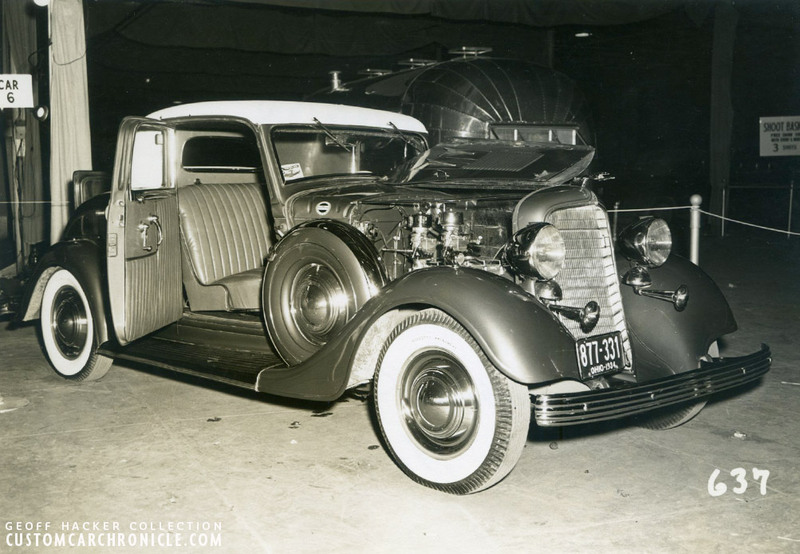 The doors were cut down in the rear, sort of like a “Darrin dip” and the rear of the body as sectioned the same amount. Very unusual Studebaker, I guess a bit typical for the mid-west, east coast styling at the time. A lot of add-ons, mix of styles, to create a more exclusive car. Sam Benanti, Kansas City brought his ‘49 Merc engine powered ‘32 Ford Hot Rod. Unusual large front tires give this Rod an almost toy like appearance. 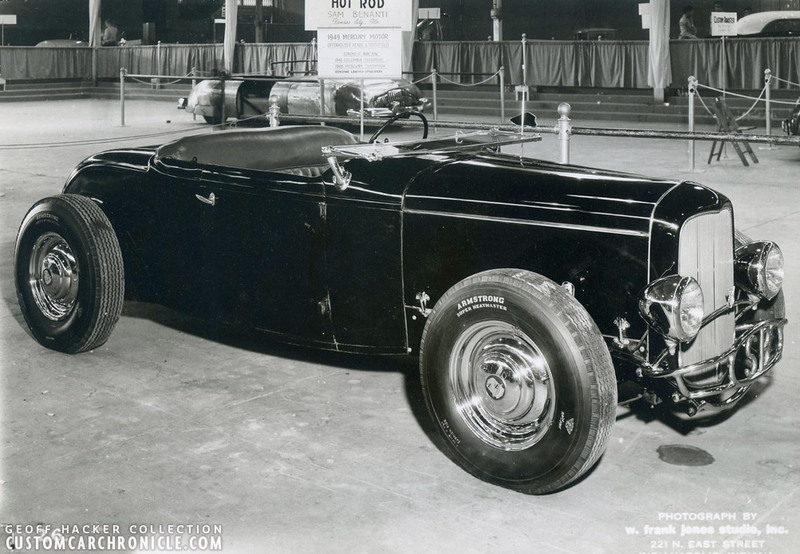 Unique Art-Deco styled short wheel based Roadster looks to be using ’47 Cadillac fenders, an rakes windshield and soft top. Anybody knows more about it? Sports Customs have always been very popular with Mid West and East Coast builders. 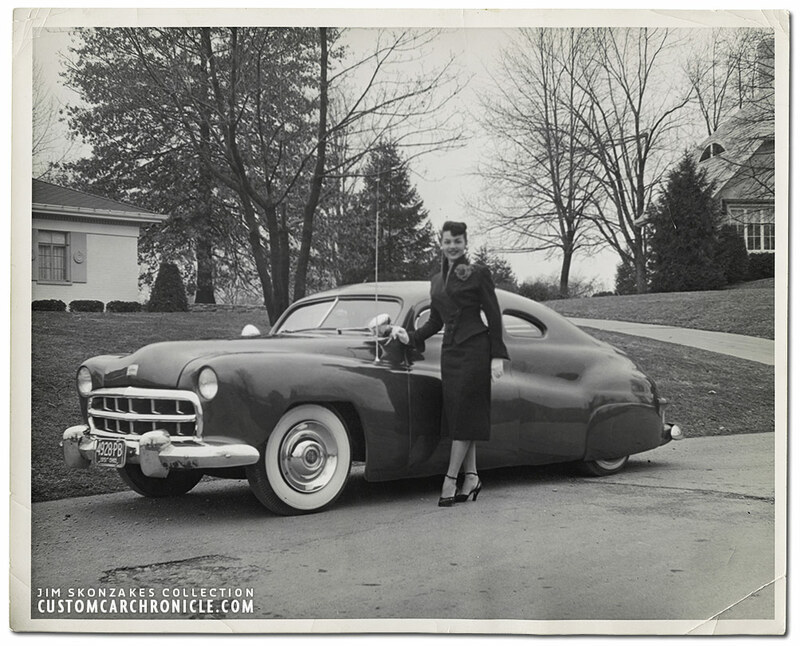 This unidentified sample looks to be based on a late 1940’s GM car. It features welded doors with a deep “Darrin dip” and what appears to be a speed-boat V-windshield added. 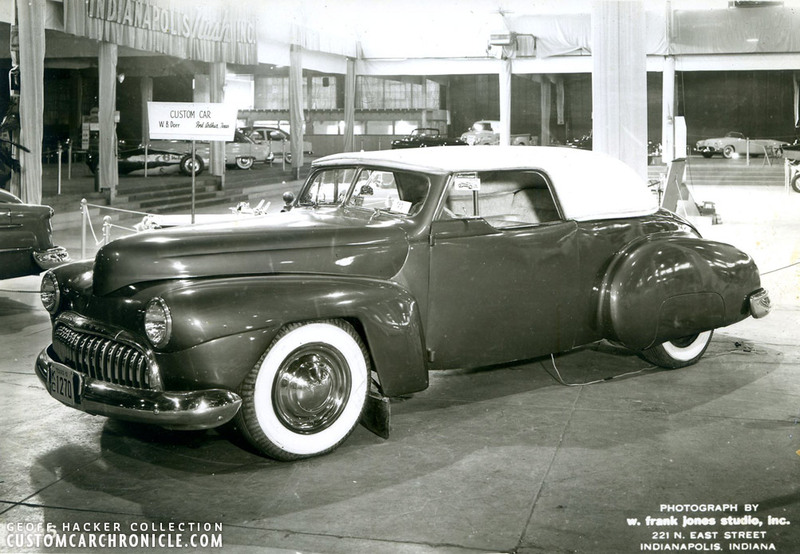 with a Buick hood, and ’48 Cadillac grille, and ’47 front bumper. 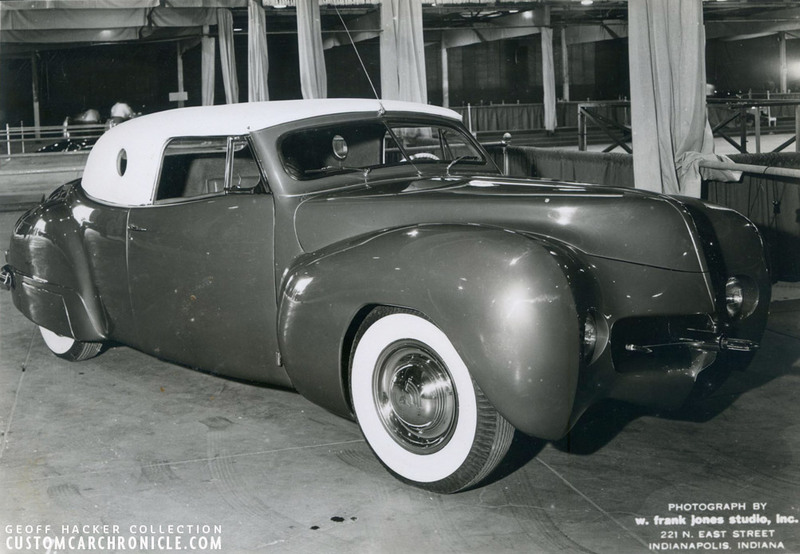 Another Sports Custom looked to be based on 46-48 Mercury body panels. 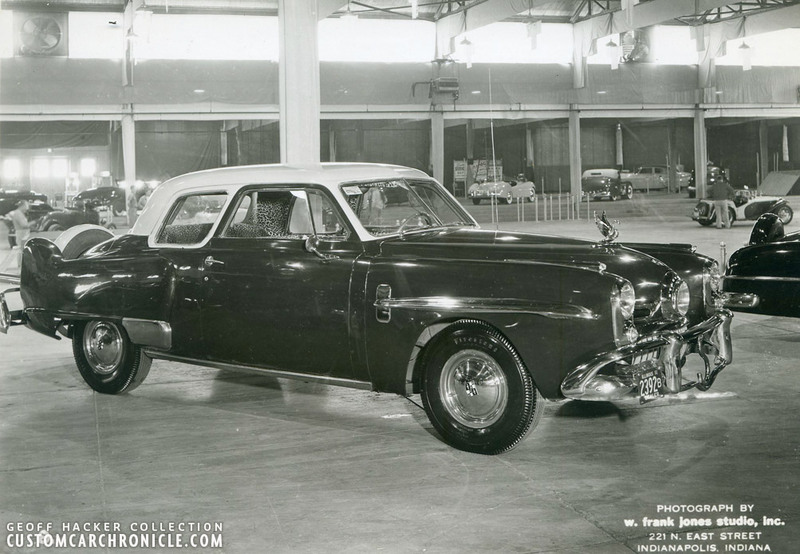 Possibly a four door sedan, shortened, with all body panels, including full fade-away fenders fully molded together and a heavy chopped windshield. Don & Bill Cunningham 1940 Mercury was a well known and well build unique ally restyled Custom in the Indianapolis area. The two brother did all of the work on the car themselves, including channeling the body, sectioning the hood, completely reshape the front fenders and grille area. The doors have been cut with the ever popular “Darrin style” dip and the padded top has unique boat style porthole windows added. The car was painted with a custom mixed Lavender Rose paint and finished in 1950. The headlights are placed deep inside the grille. 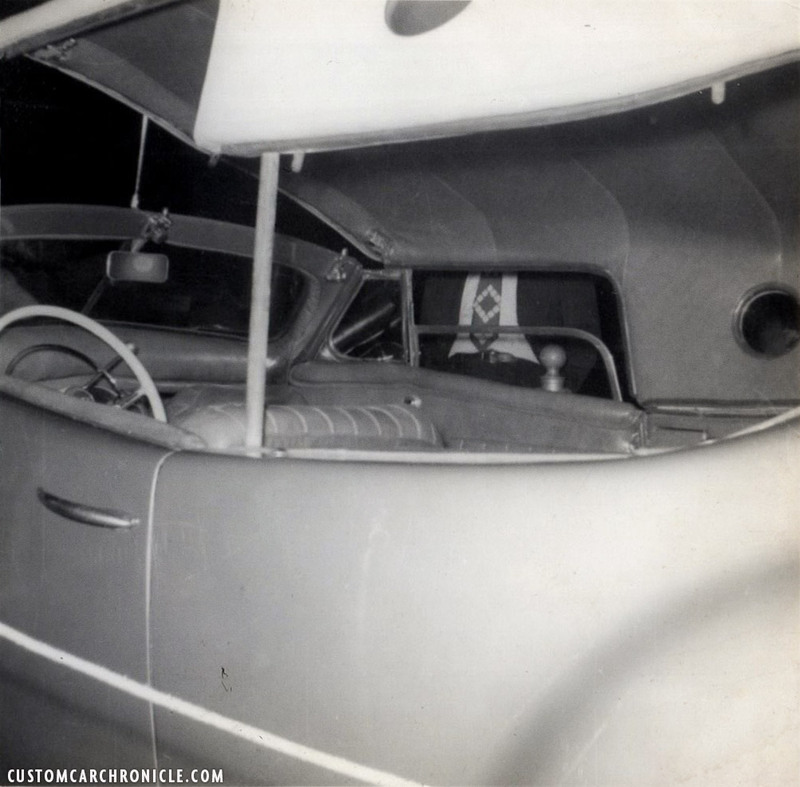 The interior was done in all leather and the passenger seat could swivel 180 degrees so the passenger could look to the people in the wrap around rear seat that had a 7 inch TV and small bar installed. The padded top was opened up halfway at the show to be able to look inside to see the unique interior features. For the 1952 show the Cunningham brothers made a few updates on the car, including new headlights, placed outside the grille. and an satellite antenna like grille. 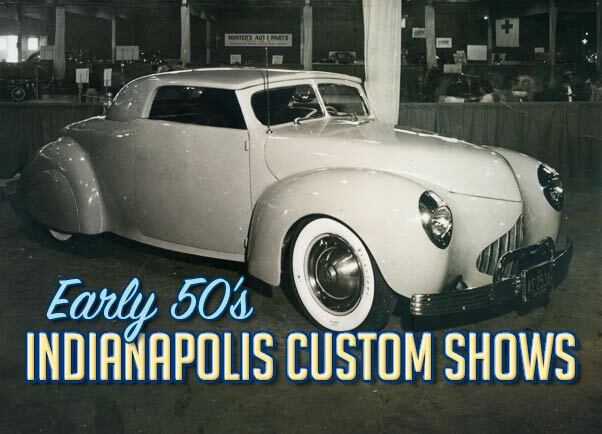 Dean Causey from Indianapolis entered the show with his very nicely done chopped and channeled ‘39 Ford convertible. He created a really great looking removable steel top. The belt line was filled, fenders molded, running boards removed and the hood was sectioned. He added a custom grille, De Soto bumpers and aftermarket hubcaps. Another interesting car with some added Custom Touches as Sombrero hubcaps, and ’41 Oldsmobile bumpers. Very nicely mildly re-styled 1940 Mercury Convertible featured removed running boards, shaved body, 46 Ford bumpers and aftermarket “sombrero” hubcaps.Notice the black painted letters on the white wall tires. I have seen this done on a few cars. Not sure if it is a Mid Western thing. The shows were not held in the Coliseum. All of those inside photos were taken in the Manufacturers’ Building. The Coliseum doesn’t have a lowered center section or support posts for the roof. Does anybody know what happened to these cars?